This bright and cheery illustrated book for kids ages 5-7 breaks down STEAM subjects, like science and technology, into fun and easily understandable chunks. Join Robert Winston and the Science Squad to unravel the mysteries of the world: find out how robots work, what a food chain is, where lightning comes from, how lungs allow you to breathe, and much more. 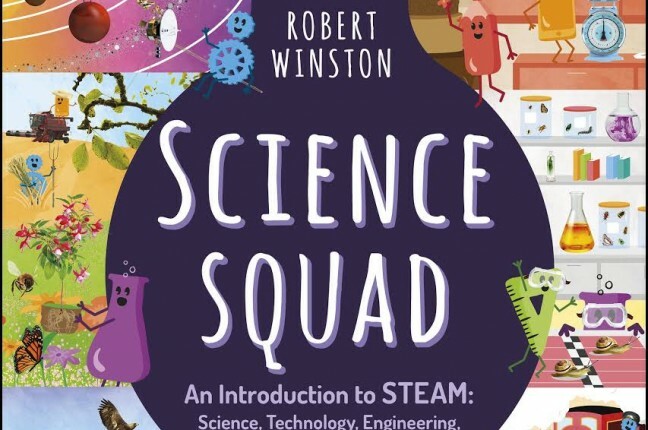 The Science Squad characters (Science, Technology, Engineering, Art, and Maths) guide the reader through the book and are always on hand with tips, fun facts, and simple explanations. With pages covering living things, the human body, space, physics, geography, math, engineering, and chemistry, this book is a perfect introduction for kids starting to learn about science at school, or those who are just developing an interest in how the world works.